Click Here To See What If? #24 Comic Book! Only 1 word can describe this AMAZING SPLASH.......WOW!!!! Gil Kane was the iconic artist who drew the EVER classic ASM #121 and #122 stories in 1973 where Gwen Stacy and the Green Goblin each died! Any Spiderman / Goblin battle pages from those 2 books would possibly sell for 75K-100K EACH! 7 years after those 2 classic "DEATH" issues, Marvel decided to have the great GIL KANE again draw a new "WHAT IF?" 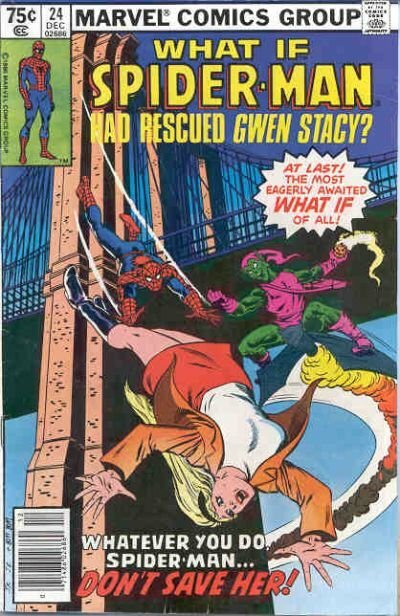 story fittingly titled: "What If Gwen Stacy Had Lived?" which featured Spider-Man and the Green Goblin battling those exact ASM 121-122 scenes AGAIN, but with Spider-Man saving Gwen Stacy! Since those ASM #121 and #122 pages will probably never be available for sale for DECADES, here is quite possibly your 1 chance to get arguably the GREATEST Gil Kane drawn Spider-Man / Green Goblin Battle splash page you will EVER EVER EVER find for public sale. This very nice SPLASH, was penciled by the great Gil Kane, and inked by the great Frank Giacoia! Just a great opportunity here to own one of the greatest Gil Kane Spidey splashes.....EVER! I don't believe you can find a Spider-man / goblin COVER (Outside of ASM 121 and 122) that is better than this SPLASH! ALL art on our website (including this one) are able to be purchased with VERY fair time payments, and trades are always considered towards "ANY" art on our website! Just send us an email to mikeburkey@aol.com and we can try to work something out.